The following is a guest post from Chris Huntley, co-founder of JRC Insurance Group. There may not be another industry where overspending is more common than life insurance. With nearly 1200 reputable, licensed companies offering around 10 types of policies, and most priced in 12 risk categories, there are over 140,000 possible options! Whew!! So how do you, the consumer, weed through all the options to find the most affordable life insurance policies? If that’s your question, then you’re in luck, because today I’m going to reveal my best, most “out-of-the-box” savings tips. Warning: You’re not going to find the same old worn out tips here like “apply while you’re still healthy” (no surprise) or “shop the market by using an experienced independent agent”. (You already know that). Once you’ve spoken with an independent agent and determined the right life insurance company for you, there are 3 lesser known strategies “those in the know” will utilize to reduce life insurance expenses. Did you know you can split your life insurance coverage into multiple policies? Why would you want to, and how can it save you money? Once you determine your specific needs for life insurance (what you’re protecting) you may determine you have different time spans needing protection. For instance, if you want to insure your $250,000 mortgage that has 20 years remaining, and getting your kids through college within 10 years which you estimate would take another $250,000, you don’t necessarily need to buy a $500,000 20-year term policy. You could buy a 20 year term $250,000 policy (for your home) and a 10 year term (for your kids). You’ll likely save around 10-15% on premiums over the first 10 years, and around 50% during years 11-20 when the remaining $250,000 would provide sufficient coverage. If you’ve looked into life insurance at all, you know that 10 year term is the most affordable life insurance policy type, right? … There are even shorter terms. Let’s say you’re recently divorced and required to carry life insurance until your 13 year old child turns 18. Or, you’re collateralizing a loan with life insurance, and expect to pay the debt off in a few years. In these cases and other situations, a specialty insurance product, such as a “annual renewable” policy or 5 year term policy may be your best value, and easier to obtain, since the insurer’s risk is for a short period of time. You’ll save on average 15% to 25% over a 10 year term policy, and they might even allow you to skip an insurance physical. Since there’s significantly more competition in the 10 year term policy market, there are some instances when the 10 year policy is even cheaper than the shorter terms. If so, be aware that you can purchase a 10 year policy and cancel it prior at any point when it’s no longer needed… there are no penalties for cancelling a standard level term policy, and there’s a good chance you’ll receive a pro-rated refund for any unused prepaid time period. Some carriers will allow you to purchase a policy with an annuity payment as the benefit, rather than a lump sum. The most typical life insurance payout is a “lump sum” meaning the entirety of the benefit is paid in one check upon death. An annuity death benefit, on the other hand, pays an annual or monthly benefit for a set period of time such as 5, 10, or 20 years. The annuity payment can be a terrific way to provide a lasting benefit for your loved ones, and ensure the funds last for the intended period of time. For those of us with young (or irresponsible) beneficiaries, annuity payments offer a simple way to control your beneficiary’s inheritance, rather than having to set up a trust with distribution rules and spendthrift provisions. If you’re buying life insurance for income replacement purposes, or have beneficiaries who could be challenged with handling a large sum of money wisely, you’re the perfect candidate to consider a policy with an annuity payout. 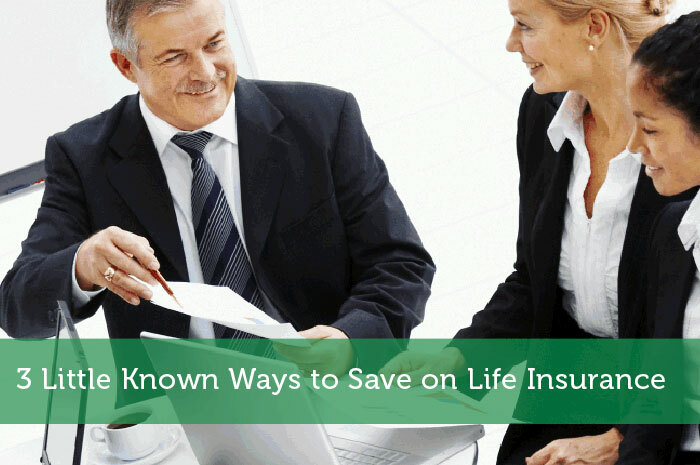 For more life insurance saving tips, see our article at JRCInsuranceGroup.com titled “Affordable Life Insurance – The 8 Most Overlooked Savings Secrets”. Thank you for having some new (and, like you said, not obvious) tips! This is actually stuff I’d never heard. That’s refreshing. Might have to start looking into the annuity thing. Each year we review our insurance needs, but the discussion is usually how much do we need and who needs it. I think there could be some more options to discuss this year. Thanks. Great tips! If people do enough work, there’s always a way to save with just about anything. Three news ways to save or for life insurance! I like your tips actually as these are really importance, which people shouldn’t be missing out. Great tips about layering policies. Doing just a little bit of thinking outside the box can go a long way to saving you a ton of money. Thanks for writing out these great tips! These are things people normally wouldn’t think of especially when diving into life insurance for the first time (me!). I have never really heard of splitting up policies. It is something to look into. Truly great tips shared as it is important to choose correct policies basis on need or requirement, but if anyone is incapable to understand each & every terms then it is better to consult the same with insurance agent to rectify the things.